(Nanowerk News) Biophotonics, or photomedicine, is a relatively unknown discipline, though it has existed for years now. You may have even benefited from it without realizing it. Some of the greatest advances of this field can be found in applications for the areas of oncology, dermatology, ophthalmology, surgery and cardiology. TV series set in hospitals often show a certain scene you're sure to be familiar with, especially if the action takes place in the United States, namely: a patient enters the consulting room and explains to the doctor what the problem is, whereupon the latter places a device on the patient's index finger that primarily serves to measure the arterial oxygen saturation as well as the cardiac rhythm. It uses nothing but light to ascertain how the patient's heart is beating. It's a common, simple application arising from the scientific field called biophotonics, biomedical photonics or photomedicine, a discipline in which light is at the heart of all research. The USA leads the field today. The European Commission, however, is also making significant efforts. Can disease be cured using light? Science demonstrates that it can. In fact, it is already being done, although we are not always aware of this. "We are often surrounded by this science without knowing it," explains Professor Romain Quidant, head of the Plasmon Nano-Optics Group of the Institute of Photonic Sciences (ICFO) located at the UPC's Baix Llobregat Campus. As its name indicates, biophotonics is a term that encompasses biology, the branch of natural sciences that studies the laws of life, and photonics, that is, the science and technology focusing on generating, manipulating and detecting photons, which are the quantum units of light. Professor Romain Quidant's group is working with gold nanoparticles as tools to manipulate very small biological systems without harming them. This knowledge is applied to prevention, diagnosis and therapy for a multitude of illnesses. According to Professor Turgut Durduran, head of the Medical Optics Group at ICFO, who makes a brief historical summary to attempt to explain where this discipline comes from and where it's going, "In the 1930s, in some medical consulting rooms where breast cancer was being researched, a light would be placed behind a patient's breast while a doctor stood in front of the patient drawing what he or she saw. Today, 80 years later, in a way, we're still studying that," exemplifies the researcher. It is a new science that has experienced significant growth over the past few decades and is now beginning to obtain results in major fields of medicine. To work in the field of photonics, you need a source of light, which can be a microscope light, a laser or radiation invisible to the human eye; then you need a biological system, such as a tissue or cell, on which to work at different levels. At present, such medical fields as dermatology, ophthalmology, surgery, neurology, cardiology and oncology are the areas with the greatest advances in biophotonics. Several milestones have been reached in this subfield, from diagnosis and ultra-sensitive imaging allowing the detection of pathologies in the early stages to tools for therapies with a minimum level of invasiveness. Research teams have also succeeded in lending some of these tools nanometric precision for the manipulation of biological material. These advances are used in certain hospitals around the world. Others are still in the last stage of research. "It is a type of science that is first developed at research centers before it enters society," Quidant points out. "At present, we're developing new tools and methods to help in cancer diagnosis and therapy," he adds. Although this discipline has been evolving since the first quarter of the 20th century, in the general historical context, biophotonics is just getting started. The variety of opportunities offered by light, together with other technologies, open numerous possibilities for medicine in the future. Romain Quidant, an ICREA professor and CELLEX fellow from France, works on pioneering projects in the field of nanophotonics. In his research, he uses both the light and the heat generated by gold nanoparticles (particles of gold of nanometric dimensions). In his light-related research, Quidant is "developing a chip that could operate as a miniature laboratory in and of itself." This device would be used to identify the "signature", that is, the differentiating marker of a cancer while it is still in an initial stage of development. This research project is supported by the European Commission and is being carried out in collaboration with oncologists. How does it work? The researcher explains: "The idea is to use the latest advances in nano-optics to detect very small quantities of cancer markers in a patient's single drop of blood. Not only biophotonics are involved; we introduce a nanotechnology component as well." Quidant uses gold nanoparticles, "very small objects measuring some 50 nanometers that can be designed to act as an efficient light nanosource." His group has managed to concentrate light on a point ten times smaller than allowed by "the most perfect" of lenses. 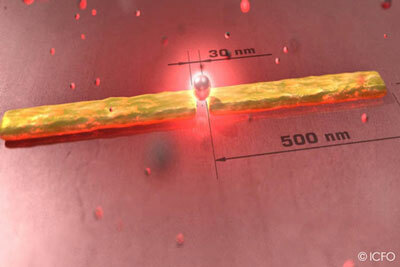 It has demonstrated that the control of light on a nanometric scale can be applied in ultrasensitive nanobiosensors and optical tweezers capable of manipulating very small biological systems without harming them. Another line of Quidant's research relates to the heat these particles generate. In this case, the heat properties are used in cancer therapy. "The aim is to specifically affix the particles to the cancerous cells and not to the healthy ones. The particles can detect the cancerous cells thanks to recognition molecules. Once the particles have been introduced, a laser is applied to heat them until the cancerous cells are selectively destroyed," explains Quidant. Does the human body eliminate these particles? "The advantage of light is that it is less invasive than chemotherapy and radiotherapy, which also affect healthy tissue," he says. "First we need to understand how an isolated cell works before we can work on a tumor." The research being done by Turgut Durduran and Romain Quidant enjoys the support of the CELLEX foundation in Barcelona. Turgut Durduran, a scientist from Cyprus and the US who now lives in Castelldefels, Catalonia, has been working in this field for years. "What happens if you put your hand against a windowpane on a sunny day? The light appears to be white and your hand, red. This is the principle of the field in which I'm working: light through tissue", he explains. One of his projects focuses on non-invasive monitoring of the blood flow and blood oxygen levels in real time using diffuse optics. "Using light, I can provide an instant view of what is happening in a patient's brain at any given moment to lend medical professionals more information on which to base their decisions. Cerebral thromboses cost millions of euros a year, and this would help the patients and lower the expenses", asserted the professor. "I basically work with hospitals. My research focuses on various projects, one of which is a monitor prototype for cerebral ischemia. We also work on issues relating to cancer, such as ascertaining whether chemotherapy is working in specific patients".